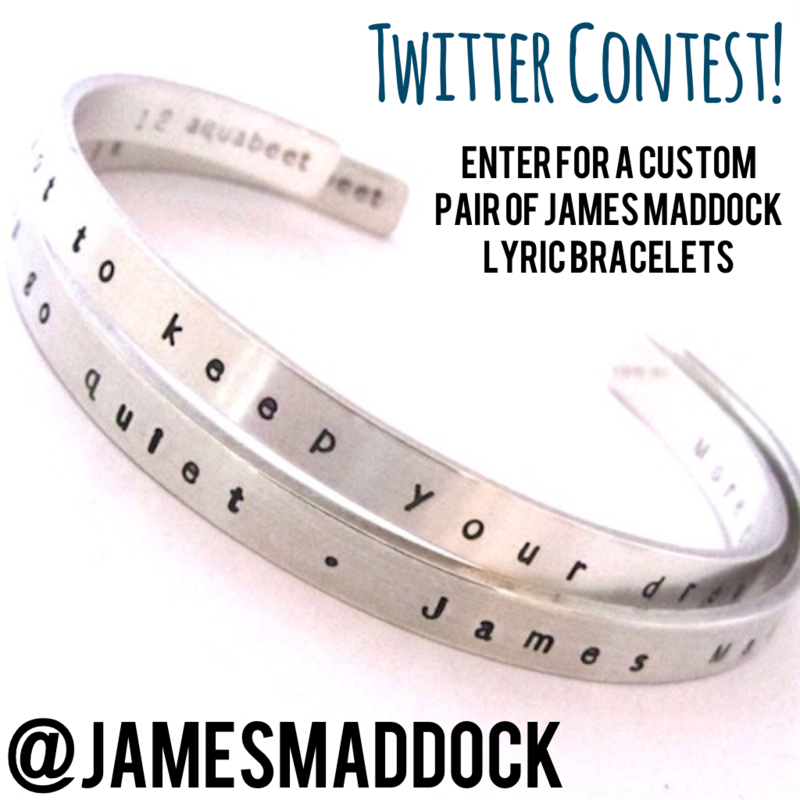 TWITTER CONTEST: ENTER FOR A CHANCE TO WIN A CUSTOM PAIR OF JAMES MADDOCK LYRIC BRACELETS! Now might be a good time to follow James on Twitter if you haven’t done so already, because it’s CONTEST TIME! STEP 1: Follow James on Twitter! We will randomly give away a custom James Maddock lyric bracelet to one lucky follower. And since two bracelets are better than one, the winner will get a second bracelet to share with a friend. You'll both be looking fashionably lyrical together! IMPORTANT: Make sure your friend is following James, too. STEP 2: After you AND your friend both follow James on Twitter, you will need to Retweet the initial contest announcement, located HERE. Consider this your way of helping us get the word out! STEP 3: We want to know which Another Life lyric YOU would like to have on a pair of bracelets. Tweet your lyric of choice from any song off the new album to @jamesmaddock using the hashtag #anotherlife. On Friday August 30th, we will randomly select one lucky winner to receive a pair of custom made James Maddock bracelets – complete with their inscribed lyric of choice. Please note that your friend must be following James on Twitter, too, in order for you to be eligible to win. DVR alert! James is performing this Saturday, August 24th on CBS This Morning as part of the Second Cup Café series. So grab your coffee, check your local listings, and make sure to tune in! Thanks to everyone who joined James for his first-ever Google Hangout On Air last week. You can watch the archived video on James’s YouTube channel HERE – make sure to subscribe while you’re there and follow on Google+ if you haven’t done so already. We hope to host another HOA soon! James’s brand new album Another Life is now available! You can purchase the album on iTunes by clicking HERE, or from Amazon by clicking HERE. Finally, there are lots of upcoming shows and even more to be added! Make sure to visit the tour page to find out when James is playing in a town near you.